Want to learn more about the Revised CES Competencies? View our webinar hosted by Natalie Kishchuk on April 10, 2019 (English) and April 24, 2019 (French). Click here for more information and registration details. One of the key roles of the Canadian Evaluation Society (CES), the professional association for program evaluation in Canada, is to contribute to the professionalization of evaluation practice. 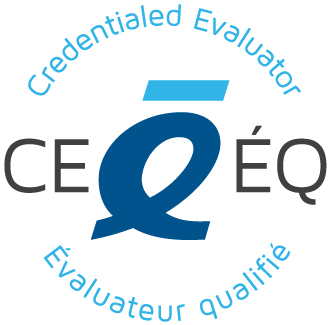 The CES Credentialed Evaluator (CE) designation is designed to support professionalization efforts by defining, recognizing, and promoting the practice of ethical, high quality and competent evaluation in Canada. The Professional Designation Program is founded on three pillars: a code of ethics, standards and competencies. The holder of the CE designation has provided convincing evidence of the requisite skills, knowledge and practical experience identified by the CES as those necessary to be a competent evaluator. The process of obtaining the Credentialed Evaluator designation is rigorous, demanding, and introspective. The applicant compiles the information into a portfolio which is reviewed by members of the CES Credentialing Board, comprised of senior evaluation professionals with at least 25 years of evaluation experience. The CE is a credential not a certificate or license (where an individual's competence on specific skills and knowledge are tested formally) nor is it an accreditation (a term reserved for programs or organizations). The CE demonstrates that the individual has met the specified competencies as described in their own words. The legal implications of the credential are limited. Rather the CE reflects competence, promotes continuous learning, and demonstrates commitment to the evaluation profession. To maintain the CE designation, CEs must accumulate and report at least 40 hours of Continuing Education Credits over three years. The value of the CE designation is such that CES celebrates Credentialed Evaluators by providing a public registry listing them. The CE designation is a service provided by CES to its members, who may elect to become credentialed on a voluntary basis. It recognizes competence and promotes continuous learning within our evaluation community. In 2015, the CES commissioned an independent evaluation of the credentialing program. The evaluation, delivered in 2016 and accepted by the CES Board of Directors, was conducted by the Claremont Evaluation Center. The full evaluation report and its executive summary are public documents. See the history of the project. On October 28, 2015, Gail Valance Barrington led the following webinar where she gives an overview of the development of the CE Program, its current status, and its plans for development. Altschuld J. W. (2005). Certification, credentialing, licensure, competencies, and the like: issues confronting the field of evaluation. The Canadian Journal of Program Evaluation. Vol. 20, No. 2. Pages 157–168. ISSN 0834-1516.